The 5am pre-dawn start was conveniently placed (twenty or so kilometres from Dalanzadgad) in the Dungenee ger camp where we stayed the night before. Away from civilisation, nestled below the foothills of the Gurvan Saihan mountains, a quiet and restful night was expected. So naïve; we were in party town! Some of our fellow campers were in high spirits partying until well after midnight. Throw in torrential rain, a leaky ger, and a 3am alarm for good measure and we do not have a well-rested runner or support. But hey, we are hard-core adventurers and we don’t need no stinking sleep. It is damp, humid and murky outside. Breakfast, a last kit check, bags loaded into the support vehicles, a last wee (because you always need a last wee and a moment to appreciate your last flushing toilet facility for some time), and we are off. The track undulates away from the camp towards a hill topped with an ovoo. Dawn was breaking and within half an hour it is light enough to dispense with the headtorch. The mountains are shrouded with low lying cloud and heavy rain starts as the route continues to undulate and meander closer to the mountains. It is just like home: I travelled six thousand miles to run in mountains and tipping rain. Not really what you expect in the Gobi. The scale of the mountains: the views over the plains: the scattering of nomad gers with herds of goats and horses are the clues that this is very definitely not Scotland. Twenty kilometres in I arrive at the start of the Yolyn Am gorge, one of the highlights of the Gurvan Saikhan National Park. A gorge so high and so narrow in places that there is often ice still present mid-summer, but not this year. This is where it starts to get interesting, not to mention epic. What was a dry and drivable track two days earlier when the route check was done is now doing a good impression of a river. I adjust my expectations and the plan changes. This is now technical terrain and not ‘runable’: I am going to lose time. Dave decides he will guide the way on foot. 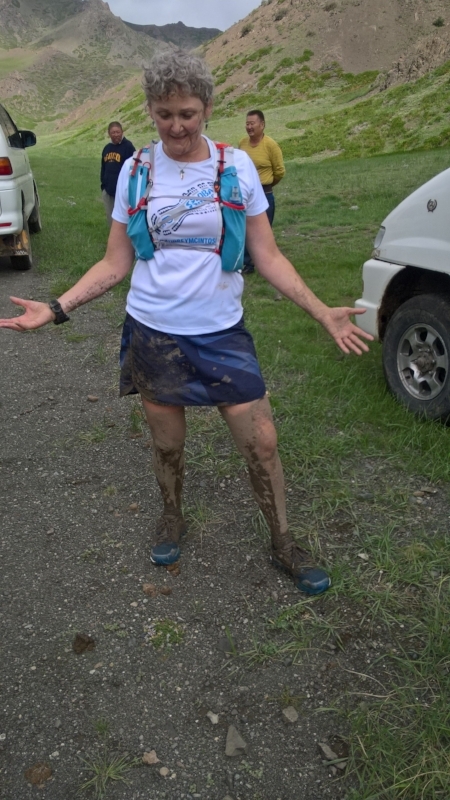 Over the years I have grown to enjoy technical terrain, wet feet, crumbling banks and sloshing about in fast flowing knee-deep water is not a problem. It is fun. My adrenalin is pumping, and I am buzzing. It is exhausting. I press on as fast as I can, zig-zagging from side to side, but not at the expense of enjoying my surroundings. I am witnessing a gorge re-shaping itself, eroded earth banks as tall as myself in places; all manner of small birds; vultures circling above the cliffs; Pallas Pikas, rodents that looked like giant hamsters and the size of a small rabbit; nettles with particularly nasty stings that can sting through clothing. Clambering up a small waterfall and suddenly coming face to face with a couple of Japanese tourists is a tad bizarre for both parties; but is the sign that I am coming to the end of the gorge, exhausted, hungry and thirsty. Distracted by the on-the-hoof change of plan I had failed to re-stock my supplies at the start of the gorge and am now a bit ‘punchy’ having run out of fluid and food, hoping that I will meet up with my support vehicle soon. The backup support vehicle is there but has little in the way of useful supplies: coke zero, sugar cubes and two raw goat legs! The next section is roughly eight kilometers downhill on a track. Gravity can pull me along until I rendezvous with my support. Bowling along happily, daydreaming, all going well until my leg disappears entirely into a cunningly disguised mud pool. I pitch forward, my other leg goes in too and just before I do a complete face-plant my hand lands on terra-firma: phew! And, of course, I have an audience of bemused and amused tourists. I drag myself out just managing to keep my shoes and my white t-shirt is miraculously clean. It looks as if I am wearing leggings. A spa mud treatment on the go: a nice bit of multi-tasking. I can’t stop laughing. Another kilometer or two down the track and I see the support crew. Alasdair is agitated as he knows that I will be out of food and fluids, and he seems to not notice the mud, even thought everyone else is falling about laughing. I decide to take a longer stop to get plenty of food and fluid on board, re-stock my pack and to clean up. Packing that second pair of shoes and extra kit was a really good call. It is bright and sunny now and the temperature is rising steadily. The track continues downhill, flattens and opens out revealing the most incredible views over the plains which are shimmering in the sunlight and heat. It looks coastal. I could swear I am looking out to sea. Next, I cross a road and the route heads into another gorge. This one is wider, far less dramatic and more benign, but it also wet and full of shallow rivulets. It is clear, that here too there has been a large volume of flood water flowing through. I then move onto the plains with another long downhill section, running along in the baking thirty-one-degree heat, with the scent of onions and pineapple rising with each footfall. The views are stunning: vast blue sky and heat haze shimmering over the green plains as far as the eye can see. As the terrain flattens out and with about twenty kilometers to go the route takes a sharp right and heads towards Dalanzadgad, plains to the left and the mountains on the right. I am hot and tired but know that the temperature will start to drop as evening approaches. Walking breaks are increasing. The mountains darken as a rainstorm brews and blows along them. I can see the rain sheeting down: is it coming this way? Thankfully not. A lovely double rainbow forms. I am beyond eating now, and hope that fluids will carry me to the finish. I need a ten-minute rest stop. At one point I was tracking for a bit over sixteen and half hours. That has gone and I am pretty sure that seventeen hours has gone now too; but the reality is, all I need is a finish. I must finish. I know that I can finish. I just keep moving with the mantra: if you can’t run, walk; if you can’t walk, crawl. The sun sets behind the mountains and darkness falls quickly. I am on the death shuffle now, alternating between jogging, walking and yomping with everything in between. Alasdair starts to walk short sections with me even breaking into a jog occasionally. When we reach the edge of Dalanzadgad he pretty much sticks with me. He is less than impressed with my toilet stop in the middle of the track in front of the air traffic control tower. He tells me to stop weaving into the middle of the road. It is all getting a bit surreal as I pass the music and lights of a fairground complete with a neon dinosaur. One kilometer to go, half a kilometer, three hundred meters, the support vehicle stops at the gate of the ger camp, but no I still have a hundred meters to go. 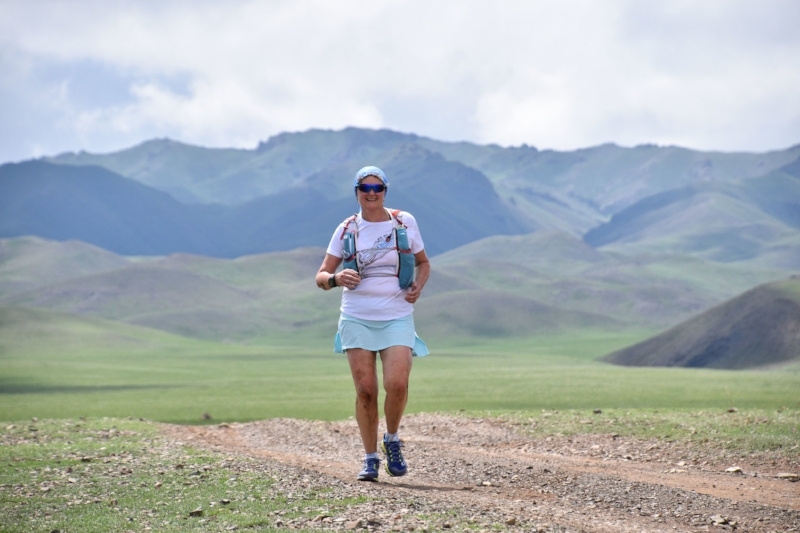 A short jog round the camp area and I am done: seventeen hours thirty minutes, but far more importantly I have completed 100k in the Gobi and completed the Asian stage of the Global Odyssey. Alasdair crossed the finish line with me, a first, which made it so, so special. I can’t really put it into words. Guess who was first up the next morning?